New York and New Jersey's Next Generation of Champions! KEA Boxing presents boxing at the Birchwood Manor headlined by Darren Goodall, Ardrick Butler and Emmanuel Folly. Doors open at 7:00. Order Tickets or Find Out More! ATTENTION BUSINESSES: Clobber Your Competition! Promote your business at our next MAJOR event! In these tough times, we've created ultra-affordable sponsorship packages for you to promote your business to new prospects, strengthen relationships with current customers and reward loyal employees! Download our Sponsorship Packet for details. Packages start at $250! Deadlines are fast approaching for our next event so don't delay! KEA Boxing is a must for all fight fans. Every card is packed with exciting local talent and pumped up fans. 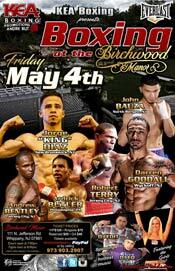 The shows called "Brawls at the Birchwood" are great fights in an upscale venue. Local stars Wayne Johnsen and Pawel Wolak are active aggressive fighters who are always in brawls. My wife and I can't wait for the next show. KEA chief Andre Kut is doing a great job keeping boxing in North Jersey alive. KEA Newsletter -- Get all the latest KEA Boxing news, receive exclusive deals and free promotions! Just sign up to receive the KEA Newsletter by completing the simple form below. KEA BOXING: Unparalleled Entertainment Value! An affordable evening watching professional sports without getting a nosebleed is often out of reach in today's marketplace. The destruction of historical landmarks such as the old Yankee Stadium, crystallizes the trend that most sports are catering solely to the corporate client, but one sport has stayed true to its roots - Boxing! Boxing is one of the few sports left where fans still feel like part of the action, and if combined with the right promoter, boxing shows are the most spectacular form of entertainment. Great fighters, upscale models and hot music keep the action going non-stop at KEA Boxing shows, and the fans absolutely love it. KEA Boxing provides action-packed boxing shows, with a touch of class. The shows are well attended by boxing aficionados, casual fans and families alike, and offer diverse boxing action, from Heavyweights through Bantamweights, and feature both male and female pugilists. Fighters have appeared on the cards hailing from boxing hotbeds such as New York, New Jersey, Philadelphia, the Dominican Republic, Poland, Canada, Mexico, Puerto Rico and many other national and international locations. KEA Boxing adds to excitement by attracting a steady lineup of celebrities, and the events are always complimented by sizzling models, as well as hot DJs who spin records between rounds and bouts. KEA Boxing also believes in giving back to the community. Through the shows, thousands of dollars have been raised for the Big Brothers/Big Sisters of America. KEA Boxing structures its shows so they are affordable, safe and exciting. In contrast to other sports, boxing shows attract analytical fans that do not alienate casual onlookers or families. Moreover, even though professional boxers are elite athletes, they are accessible. After a bout, spectators often see the contestants mingling in the crowd, and spectators are able to have personal interaction with the athletes. This is very rare in professional sports, but it seems to be the wave of the future, as sports like NASCAR and minor league Baseball have grown to new heights because of this approach, while sports like Basketball and Hockey have declined. Fan loyalty is cemented through interaction and the close, intimate setting of the venue, where fans can see every ounce of sweat (and sometimes blood!) on the fighters. KEA Boxing also offers VIP tiered price points for spectators who desire to mingle with celebrities before the show, as well as the opportunity to have cocktails and dinner with them. This provides an additional option for the discerning consumer, and has proven very successful from a business standpoint. KEA Boxing handles exciting matchmaking, pre-event planning, post-event planning and all of the other details that go into hosting an action-packed and successful boxing show.